In January 1996, Seahawks owner Ken Behring announced that he was moving the franchise to Los Angeles, where the team would play at Anaheim Stadium. Behring claimed safety concerns (specifically the building’s structural integrity in the event of an earthquake) as his reason for breaking the team’s lease with King County. However, seismologists found Behring’s claims to be unproven. Also, the Los Angeles area is even more earthquake prone than Seattle. Although Behring moved the team’s operations to Anaheim, his plans for a full move were scuttled when lawyers discovered that the Seahawks were locked into the Kingdome through 2005. Having seen his effort to permanently relocate the franchise thwarted, Behring decided to sell. 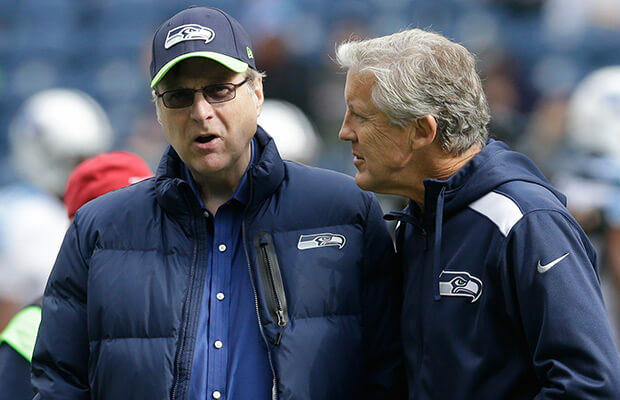 A potential buyer was found in Microsoft co-founder Paul Allen, who reached an agreement to buy the club but only if a new stadium would be built. After funding a special state-wide election for stadium financing, a new stadium for the Seahawks was passed and Allen purchased the team.